WAIST HIGH: Legendary Club Eric's To Re-Open. Legendary Club Eric's To Re-Open. 31 years after it closed the Liverpool music venue Eric's is re-opening its doors and the first shows have been announced. Orchestral Manoeuvres in the Dark, who played their very first-ever gig at Eric's in 1978, will be the first band to play on September 10 in an invitation only show. "If Eric’s had not existed, then neither would OMD," said Andy McCluskey. "Even though you cannot recreate what Eric's meant to our generation more than 30 years ago, it will be fun to play on the same stage again remembering the past while hopefully celebrating a new and different future." 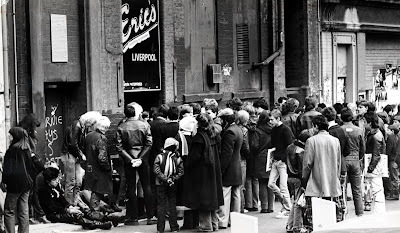 Opened in 1976 opposite The Cavern Club on Mathew Street Eric's was instrumental in launching the careers of Dead or Alive, Echo and the Bunnymen, Big in Japan, and The Teardrop Explodes. Not everyone is happy about the re-launch however and Jayne Casey (Big in Japan) said that she imagined founder Roger Eagle would be "turning in his grave" at the news. The full list of Eric's shows can be found here.